Truth in advertising has never been very highly valued in the microfinance sector. Know-your-customer (KYC) sadly is also a much-espoused but rarely-heeded principle. The current promotional video for on-line lending platform Kiva shows that Kiva cares about neither. This most widely known online microlending platform once claimed it facilitated person-to-person (P2P) microending. After the New York Times debunked that as a deceptive illusion in 2009, Kiva had to retract the claim, now fielding the (far clearer?) promise to “connect people through lending to alleviate poverty”. In fact, what Kiva does is merely lend your money for free to microfinance institutions (MFIs), which can then on-lend the money in whichever way they see fit, at interest rates somewhere between 20% and 100% APR. The joyful little cartoon video about “Pedro, a farmer who gets a loan through Kiva.org and transforms his business” doesn’t exactly make this clear. But the main problem with Kiva’s video How Kiva Works is that the claimed impact of microloans is so absurd, it prompts serious questions about who at Kiva actually knows anything about what microfinance does. Let’s briefly look behind the cutesy imagery. Enter Pedro and his family: “They live in Bolivia. Together, they run a small business, farming coffee beans, just like the ones you’re drinking now.” But Pedro has a problem: one of his cows dies, so he can only plow half of his field. Kiva lenders help him out with a loan of $2,500, and he buys a tractor.“With this loan, Pedro can grow ten times as many coffee beans as he did before.” Pedro can repay his loan, the borrower is happy, the lender is happy. The end. What’s wrong with this story? Or rather, how much B.S. fits in 1.5 minutes? 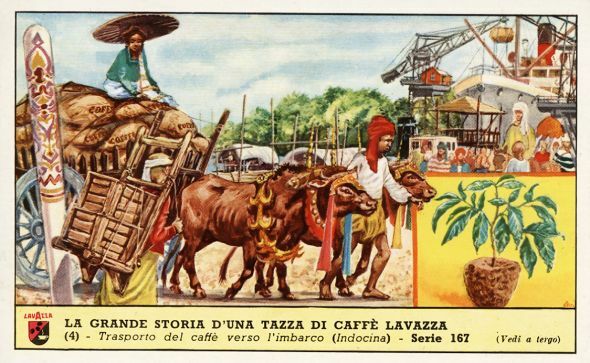 Stylised representation of coffee production from another age. Kiva can’t get basic agronomics, economics, or truth about its loans right. The story is – at best – a nice little fairy tale. At worst – given that it claims to present “How Kiva Works” – it is a deliberate deception of potential lenders about the chance they have to change lives (other than their own) with a small loan. Why does this matter? On the one hand, well-intentioned people are duped into unrealistic expections about the power of microlending. Kiva is possibly the primary access point for “everyday” people into the microfinance world. The NGO claims it has over 1.5 million users, to whom (as Domen Bajde has pointed out on this blog) it appeals with “inspiring visions of poverty, progress and giving“, which allow them to consume the feeling of charity without financial loss, and earn charming tales of entrepreneurship to boot. On the other hand, the video demonstrates Kiva’s principle of DKYC: they don’t have a single clue what their “beneficiaries” actually do. How could one trust Kiva with any money if they can’t even get their clients’ business models straight? Yet, despite the faulty (if not plainly intellect-insulting) imagery it is interesting to note the careful use of language. The video does not actually say “you are funding Pedro”; it says the loan is “fully funded” when enough money is collected. Kiva are very careful to select their words to still give the impression of a P2P platform, without openly lying. (So their legal department, at least, works.) The motive behind the video appears to be what Kiva so far has excelled at: creating the illusion of a meaningful connection between lender and borrower. The adorable cartoon farmer harks back to Muhammad Yunus’ depiction of poor people as “bonsai trees”. Reality doesn’t play much of a role in the stories Kiva tells its users, such that one may wonder whether the users or Kiva itself really care. Kiva could have very easily avoided factual errors by depicting any other Bolivian crop like corn, wheat, potatoes, quinoa – or, coca for that matter. Instead, the video has Pedro (nice cliché foreign name – check the moustache, ¡ay ay ay!) in Bolivia (some faraway poor place) producing coffee beans “just like the ones you’re drinking now“. We’re all connected through loans and coffee, and that warm feeling of global harmony is just one cup and a $25 loan away. P.S. : Other unresolved issues around Kiva – from animal-cruelty cockfighting loans, to $42 million sitting idly in Kiva’s bank account – nicely summed up here. P.P.S. : Hat-tip to Jürgen Lautwein for useful basic facts about coffee production. No doubt, large plantations employ some mechanisation, but not in the sense implied by Kiva; mechanisation is used to harvest low-quality beans in labour-expensive countries. Agro-economically and botanically the video is plainly wrong. Australian $ is roughly parity with US $. Used machinery might be somewhat cheaper in Bolivia, but $2,500 remains an illusory price. … an article, and a video, certainly worth commenting on! What do the young US students (many of whom will go to college and have regular employment) learn about the entrepreneurial “other”? And what does the Protestant ethos of the Amish have to do with the vision of entrepreneurial charity? Thanks for posting. Phil, I am glad my concerns about Kiva were helpful in framing this important critique of the unusual institution. But one aspect keeps niggling at me. You suggest the Kivans are largely duped, and frankly, over a $25 loan and in exchange for the feel-good feeling, that is little surprise. The rationality assumption is increasingly challenged, particularly by the behavioural economists. However, some Kivans are presumably intelligent and do some research. Some of the lending groups are huge (http://www.kiva.org/teams). Kiva Christians, who presumably are cautious of usury, have loaned over $9m. Google just donated to Kiva. Their list of funders includes sophisticated, well-established foundations. Otherwise credible journalists have praised the company. There is something deeper going on here. I can accept that some Kivans have neither the interest nor the resources to discover what they are actually doing, but Kiva attracts substantial attention. They don’t even bother denying the well-founded claims made against them. How did we reach this stage? I receive endless emails about Kiva, and when I explain even the basics of the problems people say “wow, I had no idea”, to which my response is generally “to be fair, it is written on the Kiva website and endless blogs if you had cared to investigate”. I think there is something more subtle, something more primordial, something more dangerous and concerning, than simply “Kiva is flawed and the impact on poverty is minimal”. Kiva manages to tap into certain feelings and beliefs in society that transacend common sense and facts. You describe this as a form of deception, akin to an email scam that some unwittingly fall into, but it seems to be bigger than this. I personally do not believe Kiva is an unsophisticated scam aimed at duping naive investors. It is more dangerous than this. Not only do I agree with your observations, but I suspect that the likes of Google do also. They are not naive Kivans. So, what motivates intelligent, sophisticated people or institutions to donate to or lend via Kiva? Hi Hugh, You’re correct to point out that there is more going on here; and I’m not saying Kiva is a scam, I’m saying Kiva uses some elements of deception, excessive simplification, and essentialisation of “others” (the borrowers) to tap into something deeper. Domen Bajde calls this deeper thing “Entrepreneurial charity”; a conception which draws on a mythology of entrepreneurialism. I suspect that the deeper desire expressed in a Kiva loan is as much to see the poor doing better for themselves as it is also a desire to see the poor working hard – and that is as congruent with a Christian morality as with a neoliberal mindset. I’ve read a lot of critique and explanations regarding kiva and how they work. The negative articles and the critique against Kiva is not measured, it’s slightly personal (anger) and kinda black and white. According to Hugh sinclairs article, and the one above, there’s nothing good about Kiva, whatsoever. Whatever they do, it’s bad, even if it’s comparable to what zidisha is doing. If feels so personal, like he has an axe to grind with them, and it’s written in an arrogant, hierarchical way. The main point of critique seems to be a perceived fraudulent misinformation how they work, but not once do they care about the reasoning and arguments for this method. As long as they can complain how they feel misinformed, they don’t.have to argue really. Cause nobody likes (perceived) deception. What’s really amazing is the arrogance with which Mr. Sinclair searches for a reason why so many people use Kiva, an explanation that doesn’t challenge any of his preconceptions, but one he can understand. If so many don’t agree with him, then “(…) something more subtle, something more primordial, something more dangerous and concerning (…)” must be going on! Which simply means everyone else but those who agree with him are too stupid to understand his common sense, his definition of facts. « ‘Team Open’: Creative Commons finally finding its role?